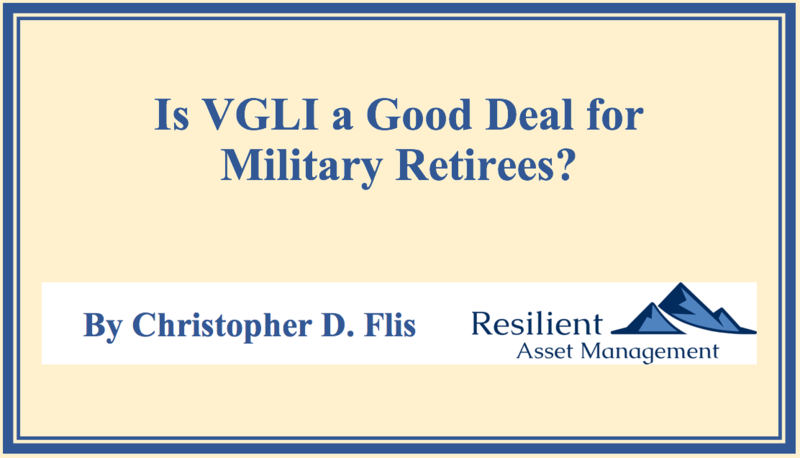 Is VGLI a Good Deal for Military Retirees? A military retiree must confront a bevy of issues during transitions. Among the seemingly endless programs and opportunities presented is the Veteran's Group Life Insurance program. While somewhat similar, this program differs substantially from the more familiar Servicemembers Group Life Insurance program. Every military member is briefed extensively on the SGLI program. For more information on that program, please read here. Once a military member retires, SGLI coverage extends automatically for 120 days and then terminates except in a few exceptional cases related to permanent disabilities such as the loss of both hands or feet...there are other exceptions as well. For most members, 120 days after retirement is the end of SGLI. The retiree version of the program is Veterans' Group Life Insurance, an entirely different program. Coverage. Insurance is available in increments up to $400,000. Underwriting. If you apply for coverage within 240 days of retirement, there is no underwriting and you are automatically covered. If you wait beyond 240 days, you will have to apply and be subject to a medical exam. You only have 1 year, 120 days to apply for coverage...beyond that window you are ineligible. Premium Rates. Unlike SGLI, VGLI rates vary based on age, although there are no alterations for either gender or smoking status, unless you have to submit to a physical exam. Exclusions. There are no exclusions for mental health, Traumatic Brain Injuries, or Post-Traumatic Stress Disorder. Guaranteed Coverage. Once you qualify for coverage and secure insurance via your premium payments, your coverage cannot be cancelled. Payments. If you make annual premium payments, there is a small discount, about 5%. Advanced Claim Payment. If you are diagnosed with a medical condition where life expectancy is less than 9 months, you can claim 50% of the death benefit. Prudential Life Insurance Company. Like SGLI, VGLI is administered by Prudential. 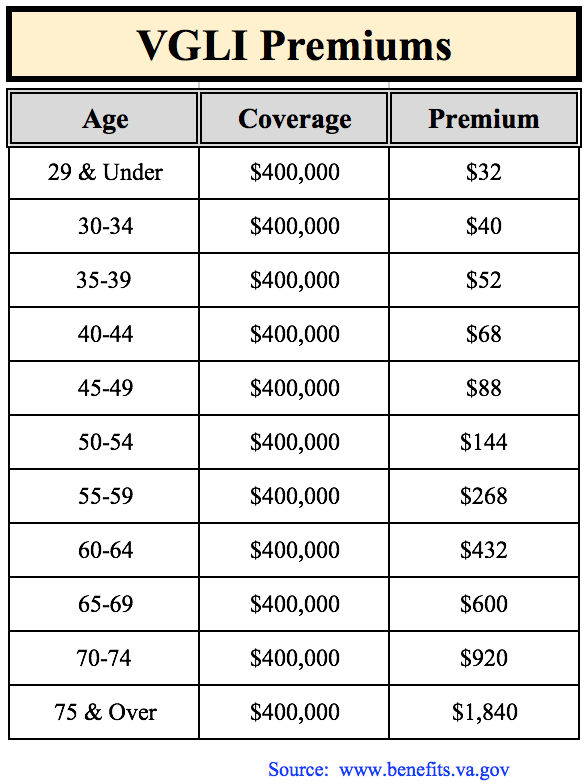 Clearly, there are some considerations for retaining VGLI coverage as the premiums escalate dramatically as one ages. 1) Do you have any insurable interests? The first question to consider when contemplating insurance is what are you trying to accomplish with the insurance policy? If you have no dependents, no debts, and no other person on the planet is relying on you for income, then you do not have what in insurance parlance is referred to as an "insurable interest". Conversely, if you have minor children, adult dependents, mortgage debt, etc., then obviously you have a definitive need for Life Insurance. 2) How much life insurance do you need? This number depends on a variety of factors too lengthly to detail here. For the purposes of this article, I will just say it is essential to accurately estimate your life insurance needs so you are not over-spending on insurance premiums with money that could more efficiently be invested in other areas of your financial plan. Military members frequently are subjected to work hazards simply non-existent in most other professions. Some of these ailments may render a retiree uninsurable by regular life insurance underwriting standards. The only verifiable way to know this is to apply for insurance and go through underwriting...you will know relatively quickly if you are insurable. 4) How much money in your budget can you dedicate to insurance premiums? Insurance premiums are like any other item in your spending plan - you have to account for them with a line item in your budget. Obviously, if you lapse on your insurance premiums, you lose coverage. Therefore, while you want to be mindful of how much insurance you need, you also want to be able to afford the coverage. Clearly, there are competitive rates out in the marketplace that are very competitive with VGLI. Og course, you will never know without applying. Therefore, it makes a lot of sense to apply to the military affinity companies like USAA, Navy Mutual, etc., who frequently have competitive rates and are used to underwriting military folks. Once you have all the data, you can then collate a cogent plan to satisfy your insurance needs employing the insurance policies of your own choosing. 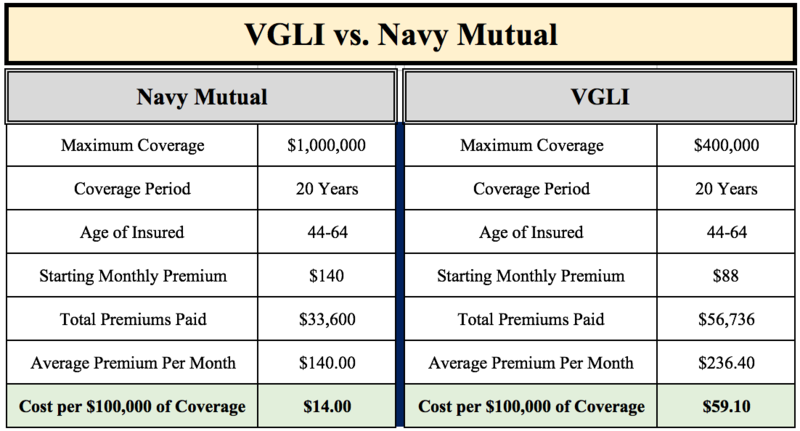 And always remember, if you are unsure about your insurability, go ahead and secure VGLI coverage as you can always cancel it later. However, if you wait beyond 24 days after retirement, you may not get coverage.